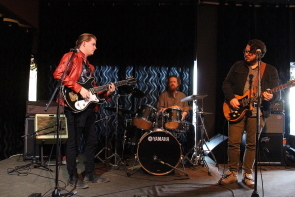 University of Lethbridge based community radio station CKXU raised $24,282 from the past week’s FUNDrive to p ut towards creating a new website with generous donors and a variety of special events including the Cupcake Carnival on Sunday, Karaoke and a big battle of the bands at the Slice, March 21. Due to being on the air, I only caught the soundcheck of winners Jane Doe, who were wielding electric 12 string guitars. 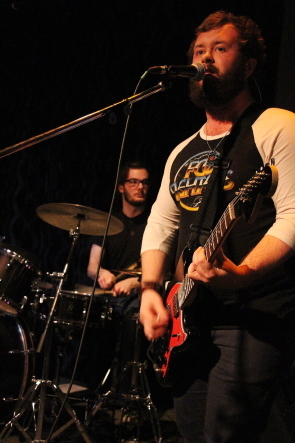 Alternative rock ’90s alternative rock band Mom Bod placed second and alternative rock duo Cope tied for third place with GreenBones. 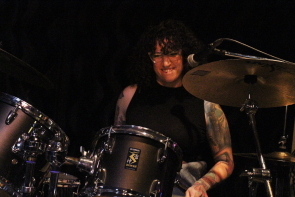 Mombod aka guitarist Mandy Fox, bassist/vocalist Silvana Campus and drummer Amberlea Parker brought a good sized crowds back to the ’90s hey day of the Riot Grrrls, playing an upbeat set of alternative rock along the lines of L7 and Hole. Sil Campus sang most of the lead vocals for their set, though Mandy Fox screamed blood for the last song of the set.